The petWALK pet door can be easily installed in movable components such as hinged or sliding doors. With thin door panels of less than 10cm, the installation is similar to glass mounting, regarding installation in thick entrance doors an elegant fully integrated mounting into the door case is possible. The panel mounting is characterized mainly by a rapid and clean installation and facilitates the smooth deconstruction in case of change of residence. 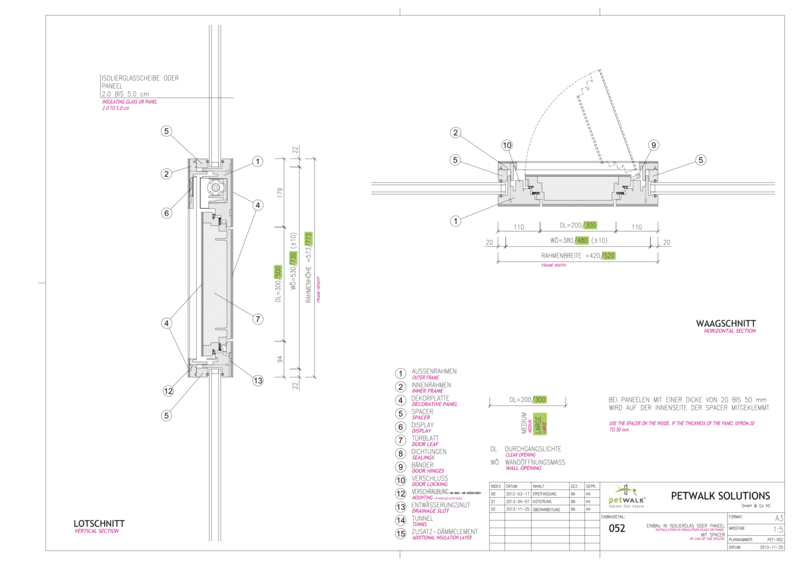 For the correct installation of a petWALK pet door the aperture for your chosen model has to be as precise as possible. The dimensions of the aperture are 38 cm ± 1 x 53 cm ± 1 cm for the model „Medium“. 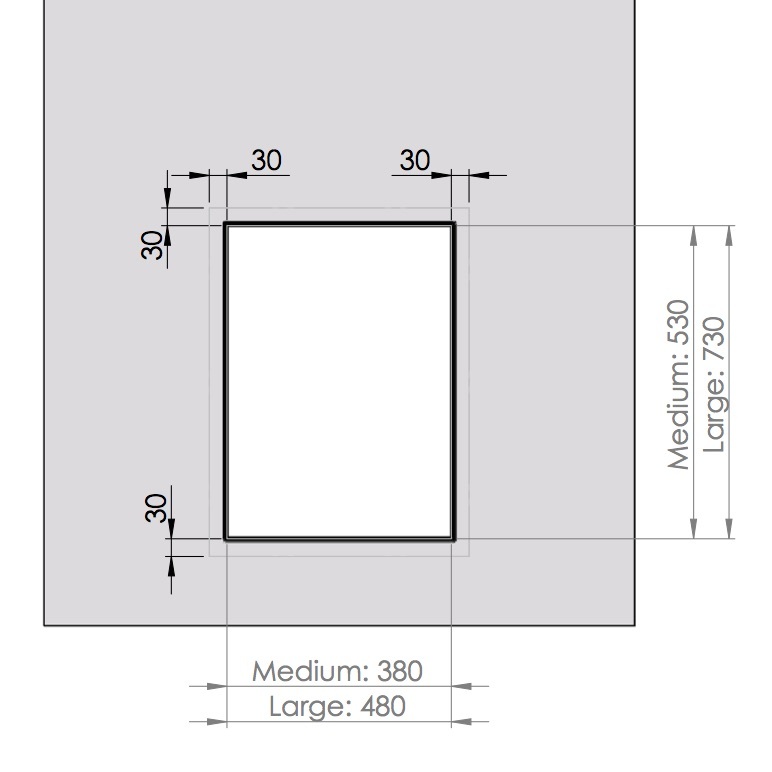 For the model „Large“ the aperture must have a size of 48 cm ± 1 x 73 cm ± 1. 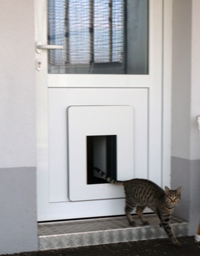 It must be ensured that at least 30 mm space up to a bound of the component is available around the aperture so that the frame of the petWALK pet door can be mounted easily. 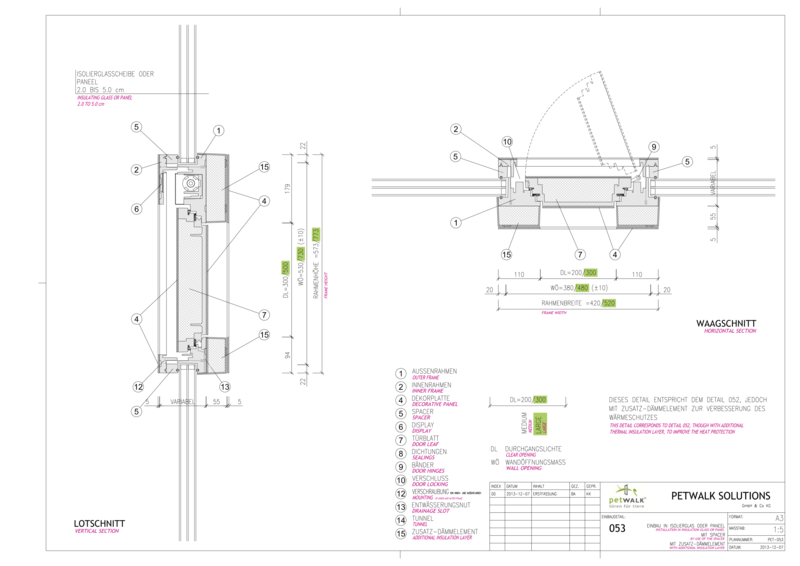 Lead the connecting cable inside of the door wing to the hinge side and use a standard transition to arrive at the frame. For your pets’ comfort use we recommend positioning the opening as low as possible. We also recommend using a door contact. If the wing is opened, the operation of the pet door is prevented, in case the pet door is open it will close immediately. Thus, a collision is prevented. All you need to connect the door contact to the petWALK door is a connection cable – door contact. Position the door as close as possible to a window bar so as to be able to hide the connection cable behind it. 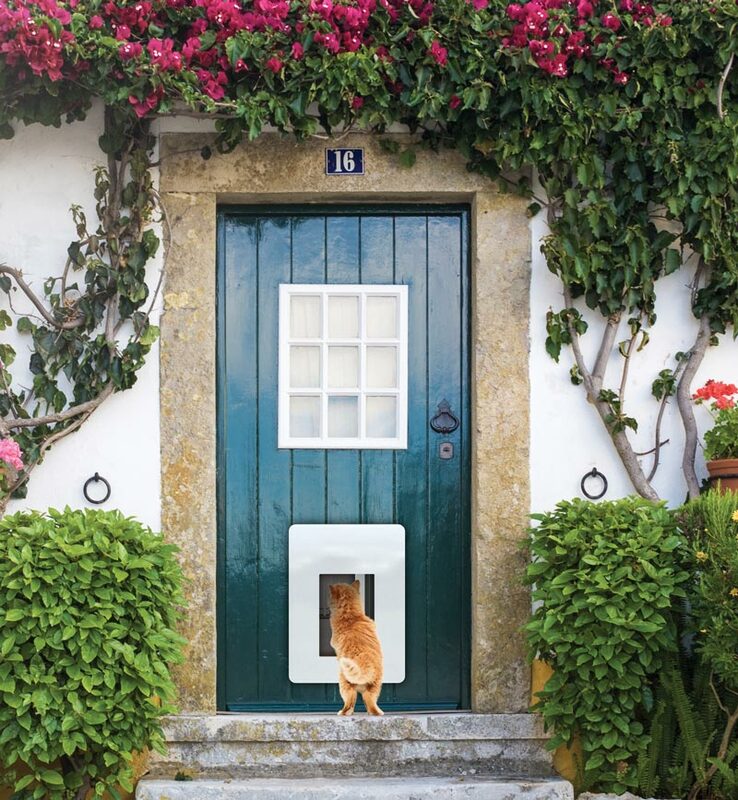 In cases where an outstanding degree of insulation is required, the frame of the animal door can even be covered with an additional insulation. The standard door module is suitable for component thicknesses up to 10 cm. Depending on the component thickness, turn the threaded rods out of the outer frame correspondingly far, so that the screw will get hold of the threaded rod. When tightening the screw, the threaded rod by itself turns back again so that a secure stability is created. Download Quick Guide - Door Panel Installation. Im Tierheim Schwarzatal finden viele heimatlose Tiere eine liebevolle und artgerechte Betreuung. Dazu zählt auch die Möglichkeit nach Lust und Laune zwischen Innen- und Außengehege wechseln zu können. Gerade im Winter verursachten die konventionellen Katzenklappen und offenen Metallschieber aber hohe Heizkosten. Aus diesem Grund haben wir gemeinsam mit der Tierheimleiterin Mitte 2012 ein Pilotprojekt gestartet und zunächst ein Katzenzimmer und ein Hundezimmer mit einer petWALK Türe ausgestattet. Die Lösung hat sich im Dauerbetrieb sehr bewährt. Die Tiere haben die Türen sofort verwendet und die Zimmer sind spürbar wärmer und angenehmer geworden. Daher sollen sobald wie möglich die restlichen Zimmer folgen.